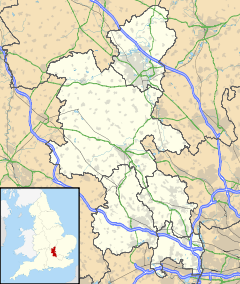 Westcott is a village and civil parish in the Aylesbury Vale district of Buckinghamshire, England, about 1 mile (1.6 km) west of Waddesdon. The toponym is derived from the Old English for "west cottage". The Church of England parish church of St Mary the Virgin was designed by the Oxford Diocesan architect G.E. Street and built in 1867. It is a Grade II* listed building. In the 20th century Westcott was the site of the Rocket Propulsion Establishment, which was on the former RAF Westcott airfield to the west of the main village. This has since been closed down, and the area is called the Westcott Venture Park. BAE Systems maintains a presence on the site (BAE Systems Environmental) which advises on the decommissioning of military sites. G.E. Street also designed the parish school. It is now Westcott Church of England School, a mixed primary school. In 2012 it gained permission to expand the age range of its children, taking them from 4-11 years old, with an integrated pre-school nursery that caters to children of 3 for half days. ^ "Area: Westcott (Parish): Key Figures for 2011 Census: Key Statistics". Neighbourhood Statistics. Office for National Statistics. Retrieved 3 February 2013. ^ Pevsner 1960, p. 281. ^ Historic England (26 February 1985). "Church of St Mary (1332800)". National Heritage List for England. Retrieved 6 September 2013. ^ Pevsner 1960, p. 282. Page, W.H., ed. (1927). "Waddesdon with Westcott and Woodham". A History of the County of Buckingham. Victoria County History. 4. pp. 107–118. Pevsner, Nikolaus (1960). Buckinghamshire. The Buildings of England. Harmondsworth: Penguin Books. pp. 281–282. ISBN 0-14-071019-1. Wikimedia Commons has media related to Westcott, Buckinghamshire. This page was last edited on 29 January 2018, at 23:10 (UTC).